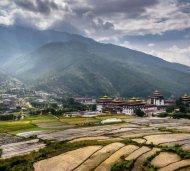 A superb trek into the heartland of Bhutan. We follow forest trails and appreciate the wide variety of rhododendrons and other spring flowers as we ascend to our camp beneath the sacred peak of Chomolhari. Suitably inspired we cross a series of high passes (each in the vicinity of 5000m) and camp in alpine meadows beneath a constant backdrop of snow capped peaks. 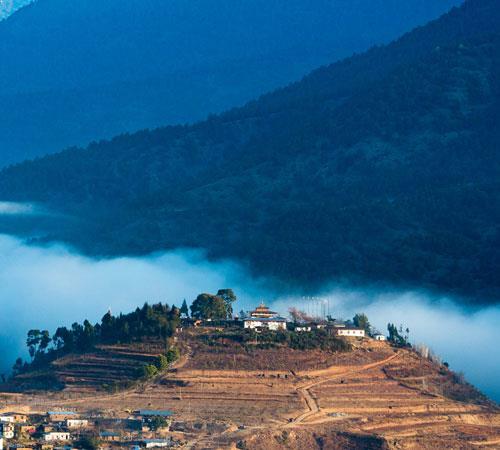 Yak herder encampments and isolated settlements provide an attractive cultural perspective to our trek, while time in Paro and Thimphu provides a further highlight to this outstanding itinerary. After clearing customs and immigration you will meet your Bhutanese leader and drive a short distance via the main street of Paro to our accommodation. At some stage of our visit, we have planned visits to the main part of town, and a visit to the National Museum. 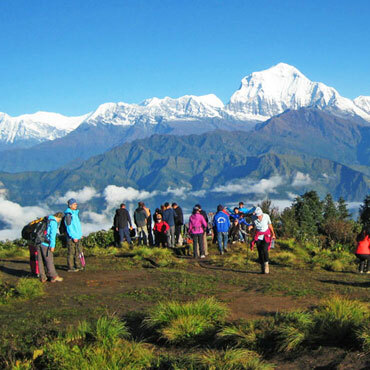 It will depend on our time of arrival into Paro, and when trek preparations are completed. The touring program will take in the grand Paro Dzong which dominates the valley and is the most important Dzong (fortress) in Bhutan. It is the model by which all other dzongs are constructed. The watchtower above it, Ta Dzong, is also an impressive building that houses the National Museum that is very informative. Old costumes and battle dress, together with priceless jewellery and specimens of the kingdom's unique flora and fauna are included within the museum. Downtown, there is a mixed collection of shops selling basic goods, and also handicrafts of wood, cloth and metalware. Archery is the national sport and practised throughout the kingdom. Shooting ranges lined by willow trees can be seen during our travels, as well as some traditional style bridges. A really exciting and informative day as an introduction to this wonderful country (described in part above). The Paro valley is truly beautiful, being a location for various farming activities, including commercial quantities of asparagus, strawberries and shitake mushrooms for export, plus various grain and vegetable crops. It is a patchwork of colours delineated by well kept traditional design farm houses that are ornately decorated. All of the slopes surrounding the valley are forested and the hint of mountains beyond is alluring. 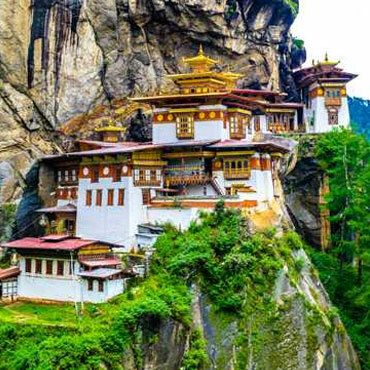 Our morning is spent exploring and appreciating the Tigers Nest Monastery or Taktsang, as it is known in Bhutan, a short drive from our resort. 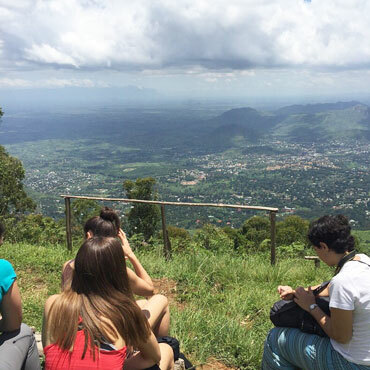 It takes us about one and a half hours to walk up the winding trail steeply through chir pine forest to a tea house and excellent vantage point. Another half hour walk takes us almost directly opposite the cliffs where the monastery is set. The monastery is the divine resting place of the Guru Ringpoche, and although it was once accidentally burnt down it has now been restored to its former glory. We return back to our accommodation for lunch and then some touring in the afternoon. At Jangothang. An imprtant day for acclimatisation. A side trip up the small valley towards Chomolhari takes us to a dramatic viewpoint towards the glacier beneath. Alternatively we may make a scenic excursion up to Sopu lake set adjacent to Nye La pass, both will be worthy photo excursions. As far as mountaineering is concerned, these two peaks, like the rest of Bhutan, have seen little expedition activity from outsiders. Doug Scott successfully climbed Jichu Drake in 1988 on his third attempt, demonstrating that conditions are not so easy on this far east location of the Himalaya being first in line geographically for monsoonal influences. From camp we commence our ascent over rolling slopes of grassland and small brush to the Nye La (4850 metres). 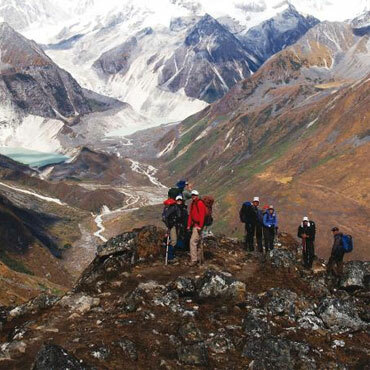 This stage is not unduly demanding and if this is your first Himalayan pass just take your time, particularly on the final steeper stages just below the pass, where grasses give way to scree and sand. The views enroute to Jichu Drake will inspire you From the Nye La we leave Chomolhari and Jichu Drake behind and make a steep descent through stands of pure rhododendron to Lingshi village. Of particular note is the Lingshi Dzong, built to protect this and the other outlying villages of Bhutan from the periodic raids from Tibet. While those trekking just to the base of Chomolhari head out towards the roadhead today, we continue to head northeastward, ascending past the Lingshi Dzong across high alpine pastures dotted with rhododendron and daphne to Chebisa. It is a picturesque valley of pastures and shingle roofed, stone houses. At its head, a short stroll from camp, is a tall waterfall cascading from a gap in rocky cliffs with a suspected hanging lake behind. Beneath are stands of very tall, gnarled juniper trees. Above Chebisa are the alpine pastures of the blue sheep and bharal that graze to the margins of the snowmelt during the summer months and descend way below the villages during the winter. From Chebisa the trail gradually ascends to the Gobu La (4450 metres). The views back to Lingshi and the surrounding peaks are spectacular. Here, hill partridges have been sighted, while the griffons may be seen soaring above the alpine pastures. The descent to our camp beside the farm village at Shomuthang is through a forest of cypress then spruce and birch with large stands of rhododendron - griffithianum and campylocarpum. Iris and edelweiss may also be in flower. Our camp is set right beside the river in a small clearing surrounded by dense bushes. Our route takes us directly upwards this morning, traversing around many grassy slopes to the Jare La. Blue sheep and griffons can often be seen here. Once at the gap, marked by flags and several cairns we can look expansively across to the adjacent valley and our next pass, the Shinge La which is the highest and perhaps the hardest of our trek. The trail winds down through rhododendron, spruce, cypress and birch towards a broad valley floor where animals may be seen grazing. This may well be our first encounter with the people of Laya whom differentiate themselves by wearing the distinctive woven conical hats with a spike in the top and colourful beads draped around the back. Their 'mobile accommodation' as with all high altitude animal herders in this part of the world, is in heavy woven tents, usually made from yak wool. 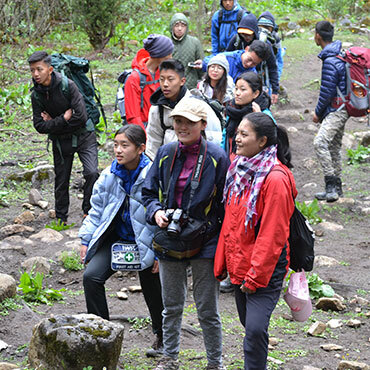 We trek several hundred metres in height up the opposite side of the valley to our camp in a hollow at Robluthang. It will take us approximately four hours to make our ascent of Shinge La. 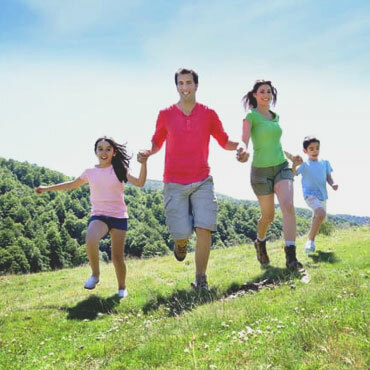 A slow steady pace is essential to gain it comfortably and make the long descent on the other side. At the pass itself there are glimpses of peaks to our left including Gangchenta. Descending, through boulders and grassy slopes, unparalleled views open out before us. Glacial blue lakes and white ribbon streams are set beneath the dramatic peaks of the 'Tigers Ears' Gangchenta. Further down, classic glacial erosion is at work, with fresh lateral and terminal moraine filling the valley floor along with an enormous milky grey lake. The forests are thick here, and our lovely riverside camp is surrounded by very tall conifers and the Tigers Ears as our backdrop. This morning we walk directly away from the mountain environment before us, descending the valley to Laya and our first principle village of the trek. The forests are thick for the several hours; and the trail winds down beside the river steeply, until we reach pastures of the farmers of outer Laya. A swing in the trail brings us up to the main settlement which is spread out over a broad spur several hundred metres above the Mo Chu river. There are approximately 800 inhabitants in this high set village, and there is a school, hospital several small shops and a gompa to meet their needs. Life is not easy in this cooler, isolated location that is snowed in winter. Much of their living is reliant on yaks (meat, wool and dried cheese), and one annual crop of barley, mustard and turnips. Beneath the village is an army post protecting the frontier with Tibet, whilst above us to the east are spectacular views ahead to Masang Gang (7194m) and the region of Lunana where the 'Snowman' trek passes. With good luck, we will be able to synchronise our change of animal porterage some time soon after our arrival. Yaks will be swapped for horses for our last trekking days. A day set aside to relax and rejuvenate after the exertions of the past few days. After a leisurely start to the day, we will enjoy some additional visiting time in Laya, threshing wheat with the locals, visiting the school or perhaps enjoying a soda in one of the small shops. Depending on logistics, we will either spend the night in Laya or descend down to the forested spur out of the village to the Mo Chuu River and camp at an army post that guards the frontier with Tibet. Initially our route takes a broad trail down fairly steeply through tall conifers to the river and army post. It then follows the course of the Mo Chu to the roadhead. The Mo Chu is a major Himalayan river that flows on through Punakha and then directly south to form the border between Assam and West Bengal, on into the Brahmaputra/Ganges and into the Bay of Bengal. The trail undulates down through beautiful forest of spruce, larch, birch, maple and rhododendron (sanguineum, cinnabarinum and arboreum). Be prepared for plenty of mud underfoot; these black fertile soils receive regular traffic of horse trains laden with goods/supplies travelling between Laya and the roadhead. Impressive waterfalls cascading over large boulders complete the setting as we trek to our campsite. This area between here and Gasa is also the habitat of the local red pheasant. Today, our final day of the trek. We will be picked up by our car half way from Ponjothang road point. This road was built to connect Laya with the rest of Bhutan as part of the government initiative to upkeep the nomadic traditions of the people in these areas and to boost their local economy. On this stage the rhododendrons are particularly impressive including the giganteum, falconeri, arboreum, sanguinium and cinnabarinum species. They are found in the midst of a mixed conifer and deciduous forest together with many alders and oaks. This stage also includes an ascent to a minor pass - the Bale La (3950 metres). From the pass the trail winds downhill to Ponjothang where our waiting vehicle will pick us up to the drive to the village of Gasa (2850 metres), the local administrative and monastic headquarters and also the site of an impressive Dzong guarding the trade route to Tibet. (if you do want to hike more today, do let your guide know. The hikes from here will mostly be on the dirt road. Below the village is the site of the Gasa hotsprings where we will have the opportunity to soak our aching joints and celebrate the end of our trek. Overnight camp Ghasa. In the morning we may have time to make a quick visit to the local bazaar before our excursion to the Punakha Dzong with its 21 temples, administrative buildings and Assembly Hall. It remains the winter residence of the 'Je Khenpo' - the head monk of the Drukpa sect - the Tibetan Buddhist sect that constitutes the official religious school of Bhutan. Overnight will be spent at Wangduephodrang. *On the 24th June 2012, the beautiful Wangduephodrang Dzong was completely destroyed by fire. It was one of the oldest and most substantial dzongs in Bhutan built in 1638. Renovations were underway when the fire started and so most of the historic relics had been put into storage and were saved from the devastation of the fire. Re-building is already underway to restore the dzong to its former glory. 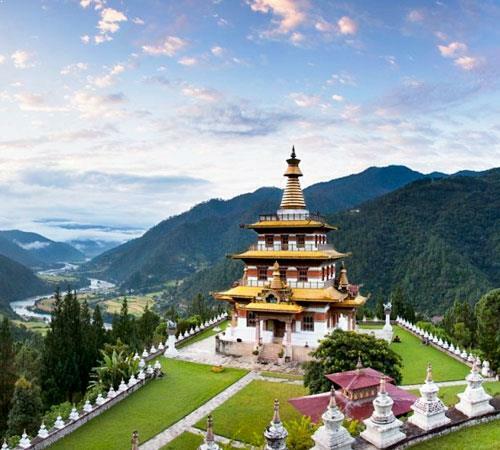 We aim to stop in Thimphu for enough time to get a feel for the country's capital. The main Secretariat building, the Tashichho Dzong is the most prominent building consisting of the main Secretariat, the National Assembly Hall, the Office of the King and the Throne Room. 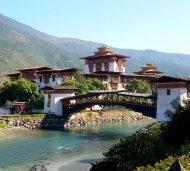 Its remarkable construction is in traditional Bhutanese style completed without the use of nails or metal of any kind. There is a large Stupa dedicated to the late King HM. Jigme Dorji Wangchuk, regarded as the founder of modern day Bhutan. Then there is the Handicraft Emporium with famous weaving, woodcarvings and paintings and also the Post Office - Bhutan's exquisite stamps are world-renowned. Our last night in Bhutan is spent at the comfortable and relaxing Mandala resort (or similar).